It’s been a while since I’ve posted an update on this project, but then that’s the nature of pursuing something like this; it takes more than a couple of days to reach max level in an MMO. Last time I had reached level 60 on my first hero in Marvel Heroes and level 50 in Final Fantasy XIV. Since then I’ve more or less abandoned FFXIV but I have continued to work on other heroes in MH2015. I have also stepped back into Star Wars: The Old Republic and Trove where I’m working toward my first max level character in both games. I’m not quite there yet with either, but I’ve made significant progress. My healing Scoundrel was level 35 when the 12x XP kicked in, however during the weeks the buff has been available I haven’t made it very far. I could have easily leveled to 60 by now if I had only been playing SWTOR, but the XP multiplier in addition to my renewed interest in Trove has really killed my motivation to play the Star Wars MMO. However I have made it to level 50, which was the level cap when the game launched. I have a little more of my class story to finish and once I do I’ll move on to Makeb. My plan is to continue this character utilizing the 12x XP so that I can start playing the Shadow of Revan content. Not only would I like to see the new zones, flashpoints, and storyline, but I would also like to start earning the credits I’ll need to raise up an army of alts. Once I’ve reached level cap on my Scoundrel, the plan is to continue with a second class in the game but this time I may turn off the XP buff, something I never thought I would do. I like the speed of 12x XP but I’d like to experience the planet storylines and I also prefer to diversify my leveling experience with Flashpoints, Warzones, and Galactic Starfighter matches rather than limiting it to just class story. I’m thinking I’ll start a Sage next, or maybe a Sage and a Commando so that I can test out both of the other healing specs in the game. In case you missed it, you may want to check out this post on why I think Trove is such a great game. I’ve been back in the voxel MMO for a couple of weeks now and I’ve made some significant progress toward level 20. My Dracolyte is now level 17 but the progression at this stage is slow going and I’ve spent most of my time lately playing the Candy Barbarian instead. Both have a playstyle I enjoy but right now the Candy Barbarian is by far my favorite. Currently my Barbarian is level 12 and at this rate I may surpass the Dracolyte class and reach 20 for the first time with this sweet warrior. I’ve mentioned this before but I’m going to say it again, the thing I love about Trove is that the leveling game and the end game are so similar that there is no reason to rush. Once you reach level 10 you have reached “end game.” At that point you can pretty much participate in everything that you will be doing at level 20 with the difficulty level increasing as you go. 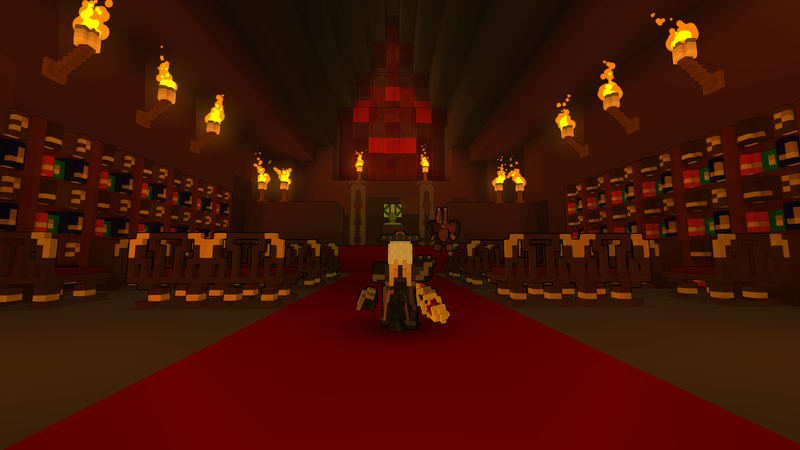 Thus the first 10 levels are a kind of extended tutorial, giving you time to grow familiar with your class so that once you reach the “Uber” zones (Trove’s high level maps) you have the class knowledge and skill sets to continue the leveling process through end game content. As I expected, I picked up another hero rather than working toward gearing out my first 60 for end game content. My approach to Marvel Heroes will likely be leveling multiple classes to 60 rather than focusing on what the game offers at max level. Of course, that might change if I find a hero that I like well enough to continue progressing but for now I’m content to continue leveling heroes. After X-23, I started to play Ms. Marvel until the Avengers XP boost was announced. At that point I switched to Black Widow and in a few short weeks I had my second hero up to level 60. This weekend I began playing up to level 10 with the other available Avengers—I have enough eternity splinters to purchase one—and decided unexpectedly on Hawkeye. I had already purchased him along with Black Widow back in December when all heroes were half off (they were only 225 Gs! ), so I still have my eternity splinters to spend at a later time. I actually tried Hawkeye last, assuming there was no way he would be my favorite of the bunch but surprisingly he was. I like the archer/ ranger archetype in general and Hawkeye has a great assortment of trick arrows—explosive, electric, poisonous, etc. The downside is that he runs out of Spirit quickly so I have been maxing out points in his basic attack as much as possible since I am reliant on it for damage. He can also be a little squishy but so long as I leave enough spirit to use his dodge ability to stay at range, I’m usually okay. Plus his Rocket Arrow is powerful enough that I can nearly one shot elites; dead mobs aren’t much of a survivability threat. Currently I’m pretty content with these three games. 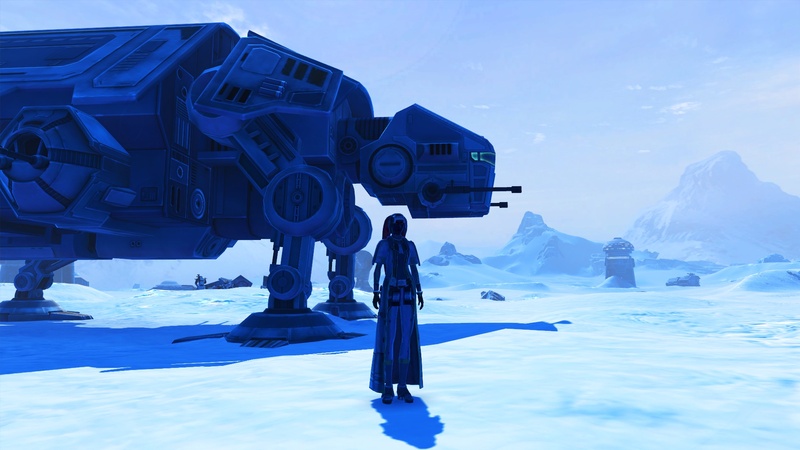 Once I’ve reached max level in SWTOR and Trove I plan on leveling multiple classes/ heroes in all three games. 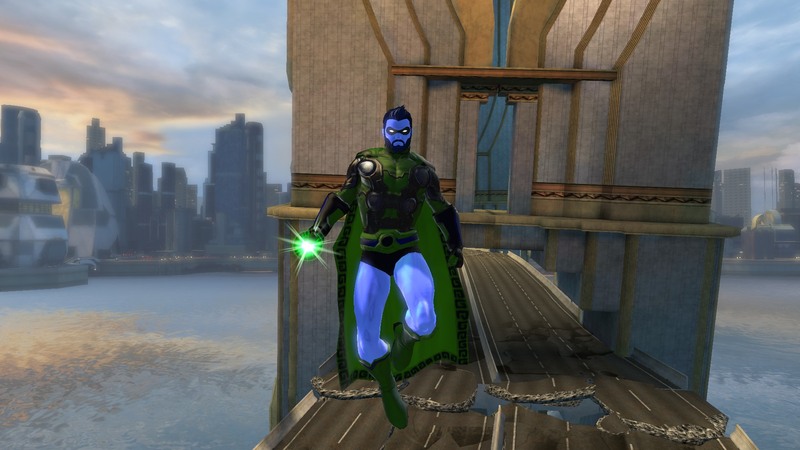 I may swap in DC Universe Online for one of the games at some point to finish my level 17 Green Lantern but otherwise there aren’t any games grabbing my attention right now. 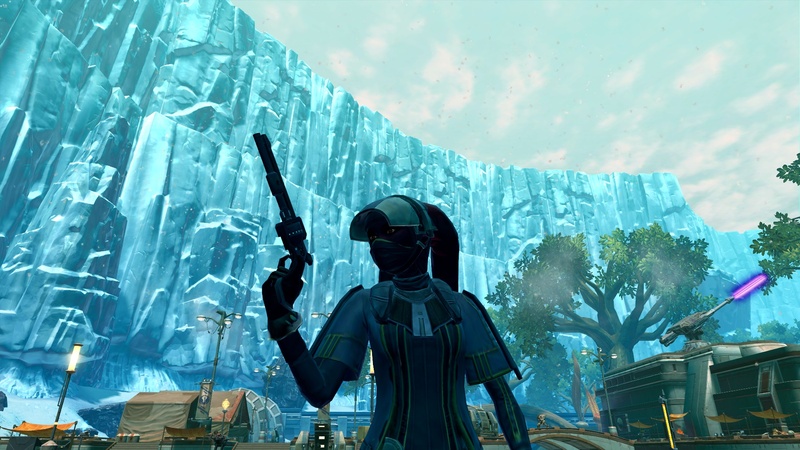 Rift and The Elder Scrolls Online were on my list, and WildStar might be as well if it does in fact go F2P, but none of these games are attractive enough to set aside what I’m currently playing. If that continues to be the case, then I may retire this idea for now or I’ll continue to cover my progress as I level new classes in SWTOR, Marvel Heroes, and Trove, discussing the differences between the various classes during the leveling process. That could be interesting, but it’s definitely not in line with what One to X was supposed to be. Nevertheless, I’m happy with the progress I’ve made. Once I finish Trove, SWTOR, and possibly DCUO, that will be five new games in which I have characters at max level. That’s a far cry away from the days when WoW was the only MMO in which I could play end game content. It’s not like I need max level characters in every MMO, only in those that I like well enough that the time invested is worthwhile. If nothing else, I would say focusing on reaching end game in several titles has helped me find the MMOs I like enough to keep playing. Playing until end game while time consuming, is a good way to give a game a fair chance to prove its worth. What I’ve found is that I largely prefer games in which end game is a non-issue like Marvel Heroes and Trove. Ironic, isn’t it? That in my pursuit of reaching end game, I discovered I would much rather play a game without it. For this week’s screenshot submission for the #NBI2015Safari, I’m giving you all a sneak peek at a surprising piece of concept art for the upcoming Star Wars: Episode VII. At this point I’m sure you have all seen the trailer featuring the return of Han Solo. What you may not be aware of is the unexpected Star Wars/ DC crossover that will be featured in the film. SPOILER ALERT: The following spoilers are completely made up. If you’re concerned about learning significant plot points that won’t actually appear in the film, now’s the time to stop reading. You’ve been warned. Does this fortress look familiar? That’s right, the last son of Krypton has abandoned earth after an embarrassing defeat at the hands of Ben Affleck and is hiding out on Hoth. Mistaking Chewie for a mutated California Brown Bear, Superman uses his heat vision to make a disturbing Wookie-skinned rug for his crystal palace. As you can imagine, Han Solo is a little upset. Armed with only a blaster and the intestinal tract of a tauntaun, Han sets out to bring justice to the Man of Steel. You may be thinking, “Han Solo doesn’t have a snowball’s chance on Tatooine to defeat Superman,” but don’t be so sure. Remember, the Corellian managed to defeat Boba Fett on accident while blind. What might he be capable of with all his senses in tact when he’s actually trying? All right, so maybe none of this is exactly what one might call “in touch with reality,” but it is a stunning picture of the Hoth landscape. 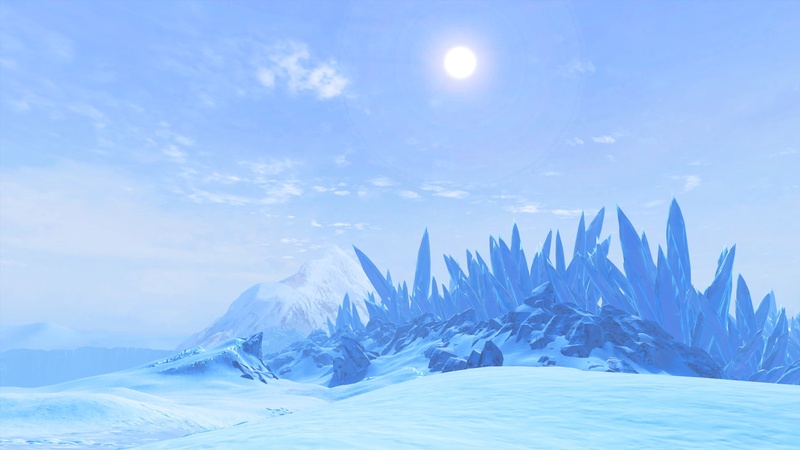 Hoth is currently my favorite planet in Star Wars: The Old Republic, and this is just one of many screenshots I’ve captured of the planet surface. The color palette is simple but spot on. 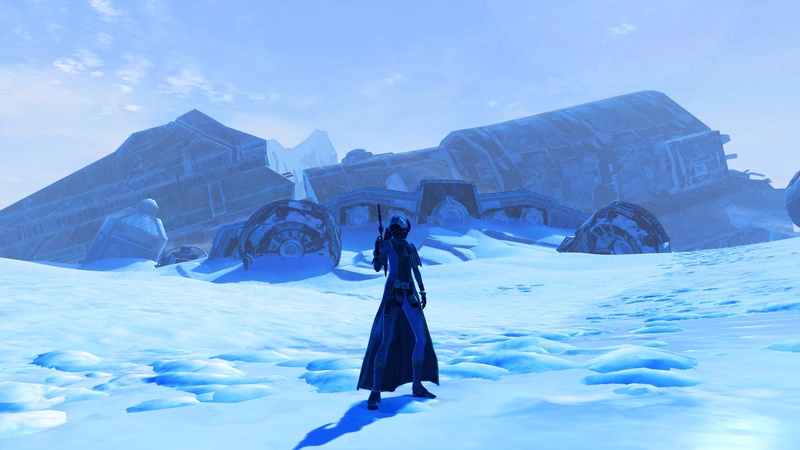 Of all the winter biomes I’ve seen in MMOs this one is my favorite. You can feel the glare of the sun reflecting off the surface of ice and snow; it is stark, harsh, and indifferent toward the wellbeing of its inhabitants. 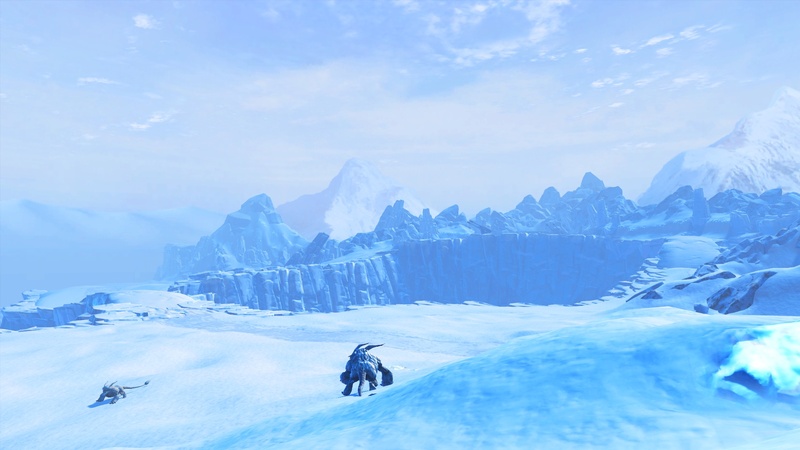 Below are a few additional screenshots of this Hoth-some planet (I’m so sorry, that was really bad). 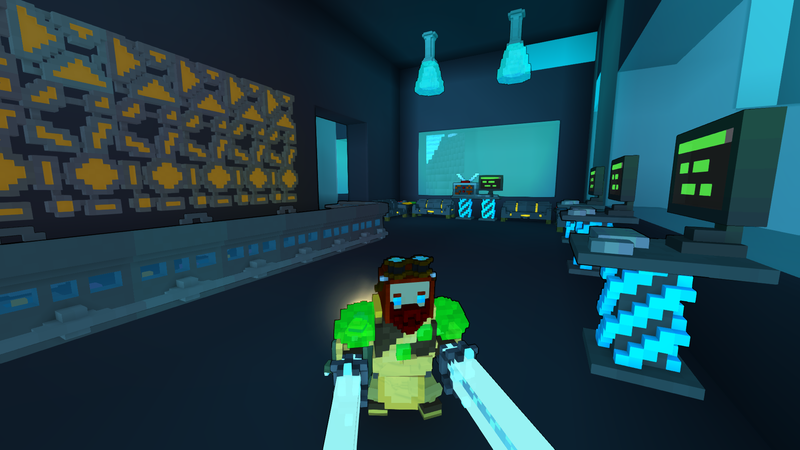 I started playing Trove a couple of weeks before the game went into open beta and I’ve never regretted the ten dollars I paid to get in. My approach to the MMO has always been casual— I rarely play for more than 30-40 minutes—however each session is always a lot of fun. The more the game grows the more I’m excited about it, especially now that there are so many class options to choose from. However despite the fact that the game is so well done, I don’t think it receives the attention it deserves. Like many other critics, I assumed at the start that Trove was a Minecraft clone, attempting to ride on the coattails of the survival sandbox’s success. However Trove is something else. 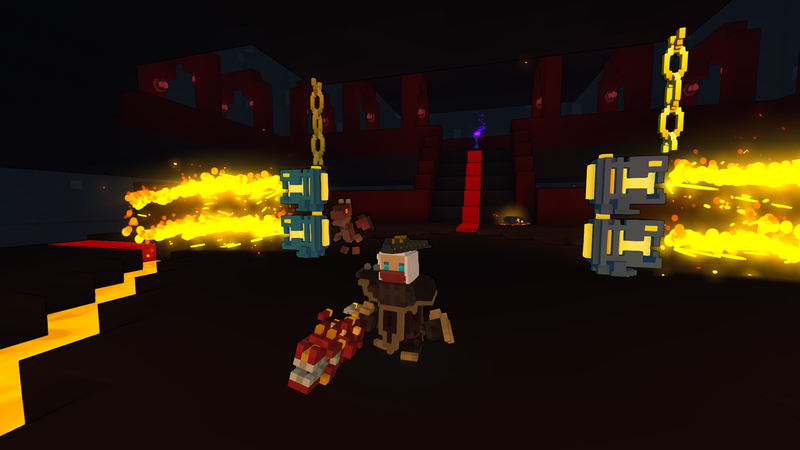 I would describe it as a cross between an action combat MMO, a voxel builder, and a dungeon crawler. Place all of that in a whimsical world that does not take itself very seriously, and you have an idea of what playing Trove is like. If you need more convincing, then here are ten reasons in no particular order as to why I think you should be playing Trove. Trove is accessible in many ways. The game is easy to pick up and takes very little time to understand the basics. The tutorial walks you through all you’ll need to know in order to enter a level appropriate world and start looking for adventure! It’s also an excellent bridge between the Minecraft and MMO genres. My kids love the open world elements of Minecraft and I plan on Trove being an introductory MMO for us to play together because it touches on gameplay elements we all enjoy. While the game is easy to pick up, there is quite a bit of depth available. As you level up you’ll definitely find challenging circumstances between the platforming required in some of the lairs and dungeons as well as the boss fights themselves. There’s also plenty of breadth to crafting, gearing, and building on your cornerstone (portable, personal housing). If you do decide to plant roots in this game, there is plenty to keep you busy. 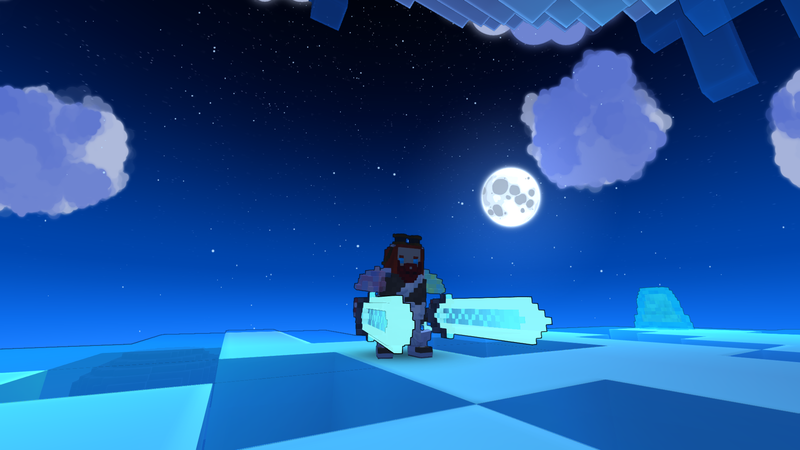 Trove allows you to customize your character’s appearance (and change it for free!) including hair, eye color, and gender. Additionally, every piece of gear you pick up can be saved for future cosmetic use. For each of the three gear slots (hat, face, and weapon) you can choose from a list of saved skins how you would like your currently equipped items to appear. Lastly, your character’s costume can be changed out, however additional costumes must be purchased for real money from the cash shop. 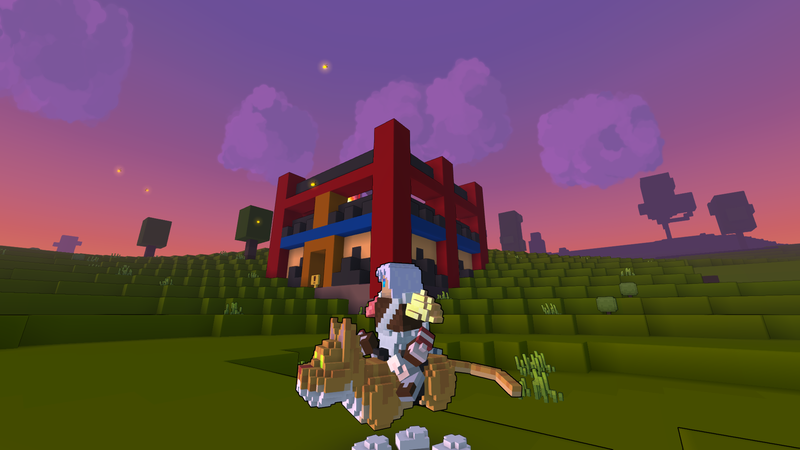 Trove is easy to play in quick bursts, making it the perfect casual romp. Once you have logged in, all you have to do is pick a portal appropriate for your class level and off you go! There is a daily reward for completing several lairs and dungeons which can be completed in 20-30 minutes and rewards currency used for purchasing additional classes along with a few other cash shop items. Even with a short play session, you can accomplish a lot. I couldn’t find the exact number, but I know the hard drive space required for Trove is tiny compared to most MMOs. For comparison, my Rift folder contains almost 20GB of data whereas Trove is showing a measly 430MB. This may seem like an odd fact to include, but if you’re like me, you have to clean out old games on your hard drive to make room for new ones which means eventually some titles have to be uninstalled. However Trove is so small, you won’t even notice it’s there so even when you’re trying something new you can keep Trove around for later. Seriously, I don’t even see how Trion is making money with this game it is so generous. With the in-game currency (Cubits) you can purchase all available classes and a few mounts, wings, and other miscellaneous items. A few cosmetics and collectibles require real money but I’ve been content without them. Some F2P games are prone to get you with inventory space, but so far with Trove I’ve had plenty so that isn’t even problematic. In the later levels you may want Shadow Keys to enter Shadow Arenas for better gear rewards and these keys are purchasable from the cash shop. They can also be crafted in game but gaining the materials takes a lot of time. For some people this may be problematic, but I’m fine with it. It isn’t necessary to enter SAs in order to enjoy the game and you are still able to make the keys for free if you are patient. Since each key allows up to 8 people to enter a Shadow Arena, you can also try playing with a regular group where each member takes a turn supplying a crafted key. Keep in mind, this is only for those serious about min/maxing their gear. 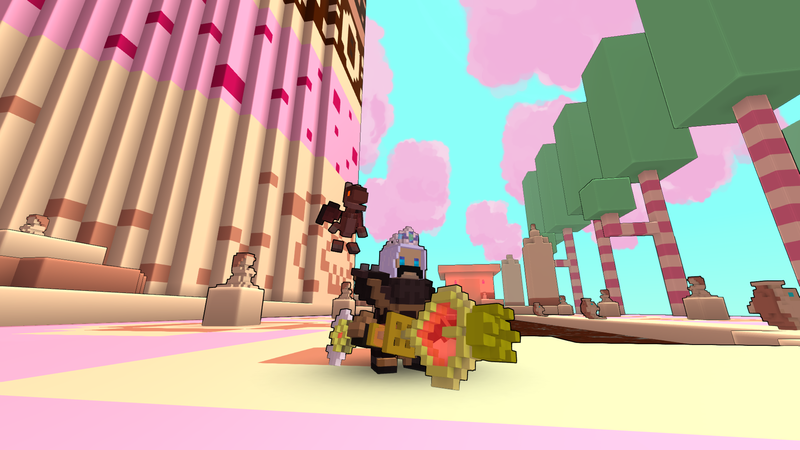 If you are playing Trove casually, you’ll definitely have plenty of content to enjoy for free and will never need to purchase or craft a Shadow Key. 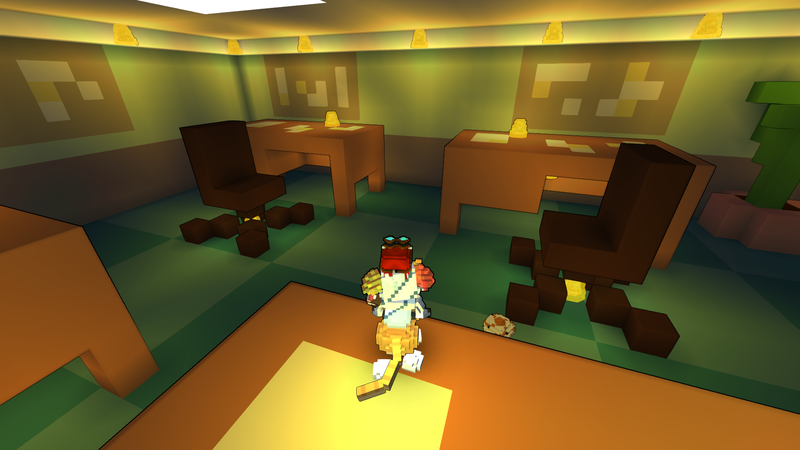 While playing Trove you will see characters wearing plungers, spoons, squirrels, and spatulas. You will conquer cupcakes in a pool of fudge, wrestle wraiths in an eerie crypt, and descend upon dragons in the belly of an active volcano. The game does not take itself too seriously, and you shouldn’t either. 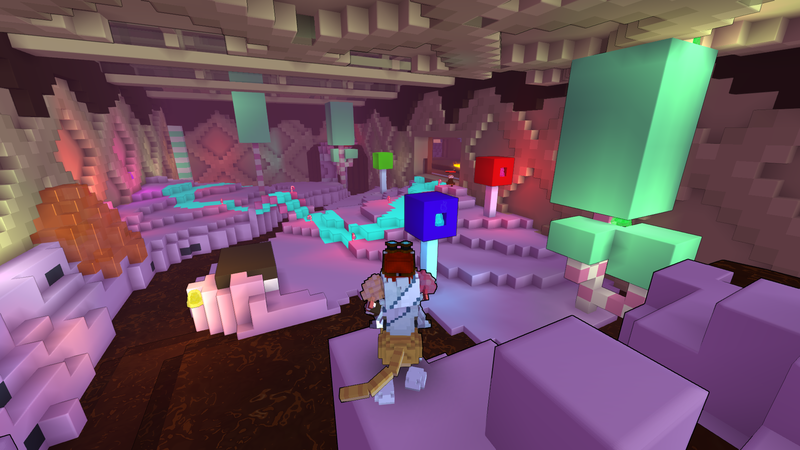 Trove’s themes evoke the limitless surrealism of childhood stories, games, and role play. It’s whimsical and ridiculous; I love it. 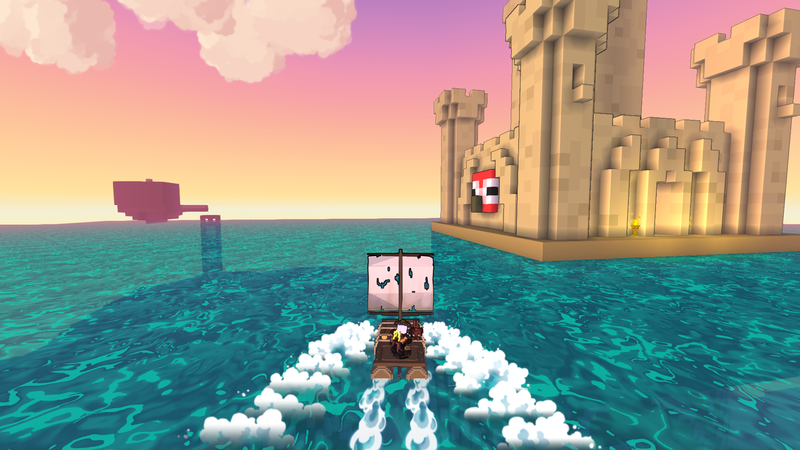 I couldn’t tell you exactly how often Trove is updated, but for example in the last two months there have been two new classes introduced, fishing and boating were added alongside new biomes, new mounts, the Golden Thread quests, and several other changes and improvements. It’s astonishing to see just how much this little game has added in such a short time. Cornerstones are player created housing that travels with you. Whenever you enter a new instance of the open world, you can place your cornerstone in one of the designated spots. Anything you have built previously within that space will show up every time you place your cornerstone. What I love about this take on housing is that it blends qualities from both instanced and open world housing systems. It is open world in that you can walk around and visit other cornerstones as you play, however it is like instanced housing in that you can “return” to your house almost anywhere in the world. Looking at what others have created for their cornerstone is part of the fun of this game. Most of that cosmetic gear I mentioned earlier? Designed by players. Several of the lairs and dungeons you’ll run into out in the open world? Also designed by players. A few of the costumes purchasable on the cash shop? Designed by players. In addition to assets in the game created by the community, there is also the club worlds, entire instanced worlds built by “clubs,” which are Trove’s guild equivalent. I’ve not spent much time exploring these worlds yet, but what I have seen is remarkable. That’s ten reasons but I could go on. I’ve mentioned in other articles how much I love the end game design because it essentially blurs the line between leveling and end game. 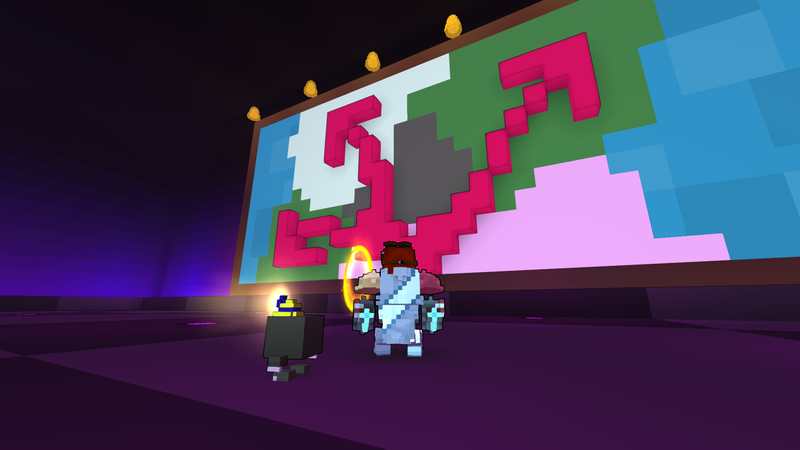 There’s never a rush to “finish” a class in Trove, because what you’ll be doing along the way is the same as what you’ll be doing at level 20. I’m also a huge fan of the class design. Right now the Candy Barbarian is my favorite but I also enjoy the Shadow Hunter, Neon Ninja, and Dracolyte. While they are quite simple, all of the classes are unique and you’re bound to find one you like. And it’s so easy to earn the end game currency to purchase them, within 2-3 months you could probably have all of them (currently) without spending a dime. Ultimately what it comes down to is that the game is fun, plain and simple. Whether you’re running around looking to pick a fight in a lair or dungeon, designing and decorating your cornerstone, or crafting rings and mounts, it’s going to be a good time. If any of this sounds appealing but you’ve never tried Trove before, I strongly recommend you give it a shot. In the world of MMO development this game is the little engine that could and it has a bright future ahead. Trove may have largely gone unnoticed over the last year but give it time; Trion has a sleeper hit on their hands with this one.